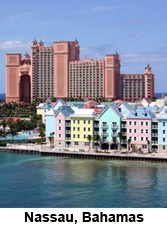 Experience the Eastern Caribbean on the Oasis of the Seas! There is no better way to experience the Eastern Caribbean than on board the beautiful Oasis of the Seas with "Heaven's Echos" and "N Him Trio". Enjoy the sounds of these two gospel groups while you sail the caribbean. Additional cabin categories include CV (Central Park View) at $671.00 per person plus port charges and taxes, B1 (Boardwalk View with Veranda) at $825.00 per person plus port charges and taxes, C1 (Central Park View with Veranda) at $1,074.00 per person plus port charges and taxes and D3 (Balcony) at $1,072.00 per person plus port charges and taxes. *Rate is based on double occupancy. Inside rate is based on a category L. Ocean rate is based on a category H. Balcony rate is based on a category D6. Suite rate is based on a category L1. Rates are subject to change and are based on availability at the time of booking. Additional cabin categories may be available at the time of booking. A non-refundable deposit of $50 per person is required to reserve your stateroom by September 30, 2015. After September 30, 2015, all cabins will have to be booked at the current published rates. A second deposit of $200 per person is due by June 1, 2016. Final payment is due by August 01, 2016. Space is limited! Contact Linda Haydel to reserve your stateroom TODAY!